I have see this info: http://www.43rumors.com/olympus-e-m5-hack-clean-hdmi-422-and-focus-peaking-possible/ Possible hack: HDMI 4:4:2, focus peaking, 1080p 120p . Vitality you think this is possible or only is a dream? Thig guy seems to just read few posts made by people long time ago. After this state few "sensational" things. funny, now the rumors site is down :D too much attention? Decrypt and unpack the FW by typing "oly_fw_manip.exe --unpack --in OLY_E_097_1500_0000_0000.BIN --out OLY_E_097_1502_0000_0000.xml". Optionally you may extract some resources (jpgs, wavs, etc.) from the FW by typing "oly_fw_manip.exe --extract-resources --in OLY_E_097_1502_0000_0000.xml --out ./OLY_E_097_1502_0000_0000.resources". Unzip and place mn103.w32 in the 'proc' subfolder of the IDA program folder. Unzip and place mn103.cfg in the 'cfg' subfolder of the IDA program folder. 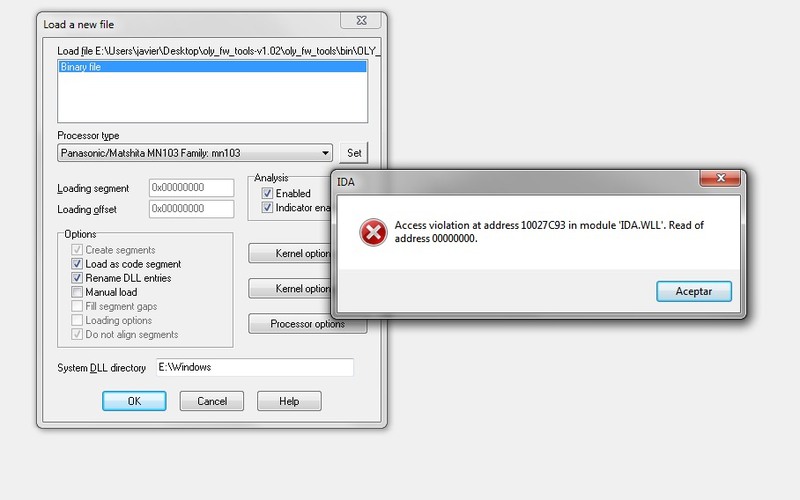 Open IDA, press 'New', then 'Cancel' the next dialog. Drag and drop "00.main-code-01.bin" in the main IDA window. Or use your favorite HEX-editor to look at it. Select 'Processor Type': "Panasonic/Matshi*a MN103 Family: mn103", press 'OK' (ignore warnings). Do your stuff, modify "00.main-code-01.bin". Re-pack and encrypt by typing "oly_fw_manip.exe --pack --in OLY_E_097_1502_0000_0000.xml --out OLY_E_097_1502_0000_0000_HACKED.BIN". Finally, to put the modified firmware back on the camera, run a local HTTP server which acts like the Olympus server, but serves the modified FW instead. Server emulator scripts are inside the tools folder. Now get hacking and give us 25 FPS video recording to begin with! While analyzing the E-M5 firmware version 1.5 in a HEX-editor, I found references to a 120 FPS and 240 FPS modes. It can be found at offset 453F0E in "00.main-code-01.bin". See attached screenshot. Anyone care to investigate further? @invaders: Sensor readout exclusively for AF, perhaps? Vitaliy you think feasible activate 60,120,240FPS some day? or is something idyllic? @Vitaliy_Kiselev There any chance that you do the hack for olympus? Regarding the 120/240FPS strings found, that's the sensor readout linked with AF performance and viewfinder frame rate (normal=120, Fast=240). @invaders , @coroander Do you think 24p is possible?
" First seen in the Olympus OM-D E-M5 compact system camera, the manufacturer’s 5-axis Movie IS allows users to record shake-free video footage even when hand-holding the camera - and also helps when taking still photographs. Other highlights include 1080/60i/30p Full HD movie recording with sound as well as 720p HD with 120fps or HVGA with 240fps high-speed movie "
I think it is very old news. It is absolutely ordinary camera without any pluses compared to Panasonic cameras. Still 1080i60. 720p120 is also long time present in Panasonics. "720p120 is also long time present in Panasonics." In Micro Four Thirds cameras? Very impressed by OMD EM5. It has beautiful colors outdoor. But GH2 get better indoor colors at hard led's colored lighting at events. All new HD lenses that looks too video at GH2, got new look at EM5 because very flexible picture style an built in curve. I never really liked Leica 25mm 1.4 at GH2, but at Olympus I can't stop shoot with all digital lenses.